Arriving at the Rustic Tri-View Drive-in. 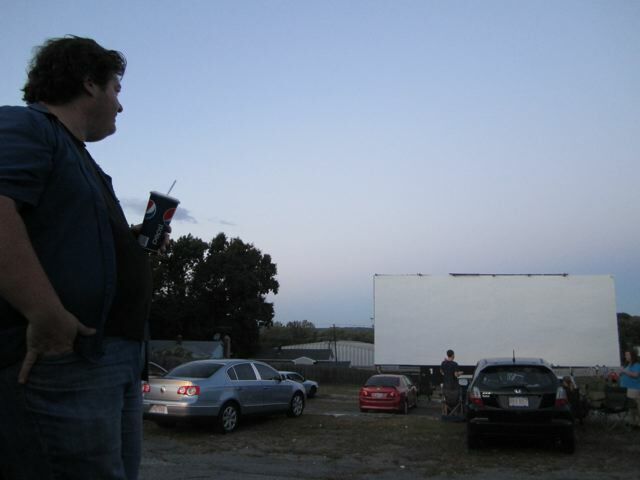 Until last night, my impression of drive-ins derived largely from a few scenes from Grease. As it turns out, it wasn’t quite like that — it was better. 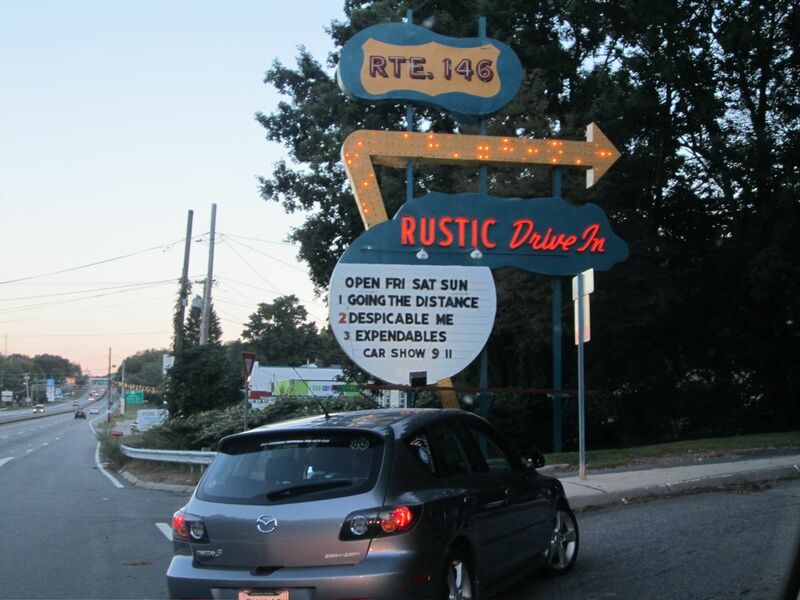 Currently the only active drive-in theater in Rhode Island, the Rustic Tri-View houses a triangular design of three screens and fits over 500 cars. Despite the line to get in, there was plenty of space to park (even when we had to get back in our car and move because we wound up facing the wrong screen showing a Samuel L. Jackson shoot-fest instead of the animated Despicable Me). Waiting for dusk at the drive-in. Even though drive-ins weren’t part of my childhood, I found there’s something charmingly nostalgic about driving your car into the movies. It only took us about 20 minutes from Providence to arrive at theater in the ‘rural’ town of North Smithfield, but it felt like another world. We brought some beach chairs and blankets so we could sit outside next to the car on the cool night (blasting the car radio so we could hear the dialogue). Some people even lounged on airbeds. It’s a popular outing with kids, and for good reason — with people more spread out, talking during the film (or getting up to go the bathroom or snack bar) doesn’t disturb other viewers. As a summer outing, their peak schedule is in July and August, but they continue to show films on Friday and Saturday nights through September 25. For $20 per car, you can watch two films back-to-back. I’m hoping they start screening a new kid-friendly film before the season ends, but I might be willing to see Despicable Me again. And movie snob that I am, that’s saying a lot. Bear and I are looking forward to checking out the Rustic before the season ends. Glad you enjoyed it!